Bob-omb Barrage (stylized as BOB-OMB Barrage) is a 1-vs-3 minigame found in Mario Party 2. The solo player in the raft avoids three Bob-ombs as the camera zooms out to show the other three, all holding Bob-ombs. 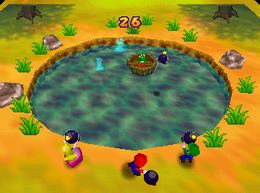 The team of three has thirty seconds to throw Bob-ombs at the other player, who is avoiding the Bob-ombs by controlling a raft in the middle of a lake. If any of the three players takes too long to throw a Bob-omb, it detonates on the player, briefly stunning them. In addition, a Bob-omb only hits the player if it lands inside the raft; if one hits the edges, it bounces off. Game Rules – "The player floating in the tub must dodge the barrage of Bob-ombs to keep the tub afloat!" Advice – "If you hold a Bob-omb for too long, it will explode in your hands. So, aim quickly and let it fly!" If playing in the Mini-Game Coaster, the human player will always play against the team of three. This page was last edited on November 8, 2017, at 18:03.